Posted by Unknown Labels: Crafts, Household Product, How-To, Patricia R.
A few weeks ago I finally made it to the Dollar Store (after trying to go there for a good two years now - here at Fort Irwin, we live very far away from everything!). 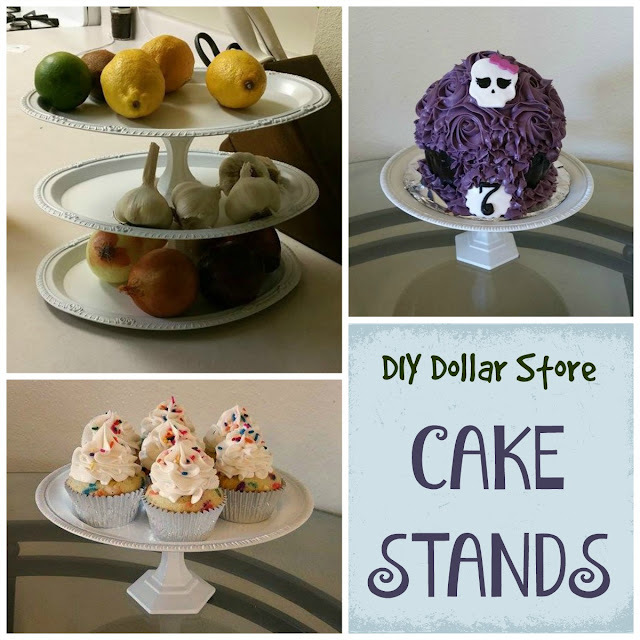 As I was wandering down those isles of amazingly cheap items I remembered a Pinterest post that crossed my path a few years ago and the memory of a Cake Stand with Dollar Store items popped back in my mind. I have been looking at those pretty cake stands ever since I started baking, but they are so incredibly expensive and this was just the perfect opportunity for me to satisfy that inner crafty monster while making something that I always wanted and without my husband coming after me for blowing the budget! total time: 20-30 min including time to dry. Place them with the metal platter down and the candle holder up and give them a nice coat of spray paint (don't forget to protect your surface with the cardboard!). I also recommend doing this outside, in the garage or at least in a very well ventilated place. Let it all dry for about 5min. Turn the cake stands right side up and give the up side a good paint coat as well and let it dry. It is really a super easy craft and the best part: you can get it all done in a single nap time! So cute! I've always wanted to try to make these. You make it look very doable! Nice tutorial on the cake Stand, very creative. Thank you for sharing with the Clever Chicks Blog Hop! I hope you’ll join us again next week! How clever are you! great tutorial! Thanks for linking up to Merry Monday! Sharing on our Mm Pinterest Board! Have a great week! What a neat idea! I might have to give this one a try. I'm pinning for later. Great idea and so easy. I have made some using glass plates, but now I can rethink using some metal plates I have. This is the best! 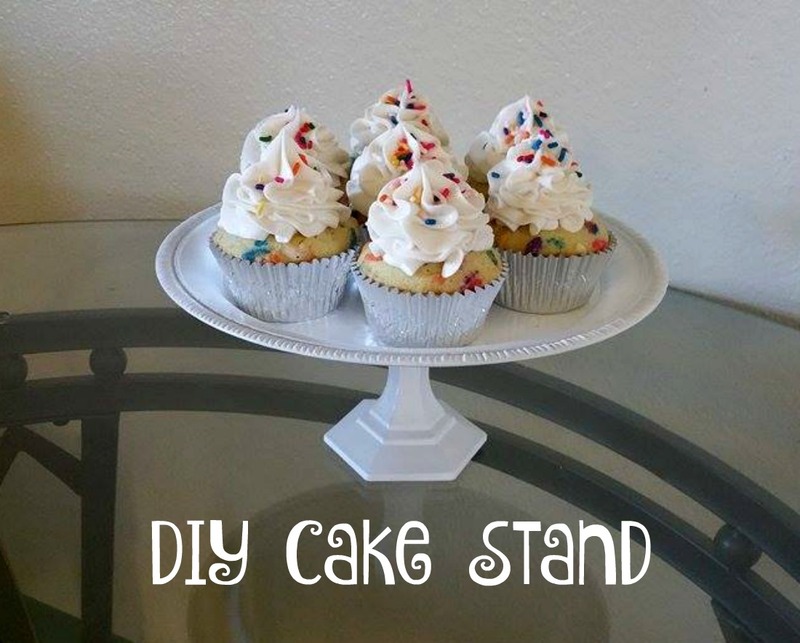 I love cake stands and I want several styles and heights, this is perfect, I am going to run to my dollar store and see what they have on hand. Thanks so much for sharing this, you made my week!!! Pinning! it's really super easy and simple! This is a great idea. I love our dollar store! You do make it look easy and thanks for linking up at the Let's Get Real Link Party #119. Hi Patricia - This is such a clever idea. Thanks for sharing it with the Let's Get Real Party. Love it, nap time craft! Those are so pretty and creative! Love this! This post is a fave for Wake Up Wednesday - thanks for sharing! That is wonderful idea, thanks for sharing with Hearth and soul blog hop, pinning, tweeting and featuring on this week's blog hop. Love this, simple and looks fantastic!! Thank you for sharing at Friday Frivolity!! :D Pinning and tweeting. Thank you everyone for all the positive feedback and all the pins of this post!